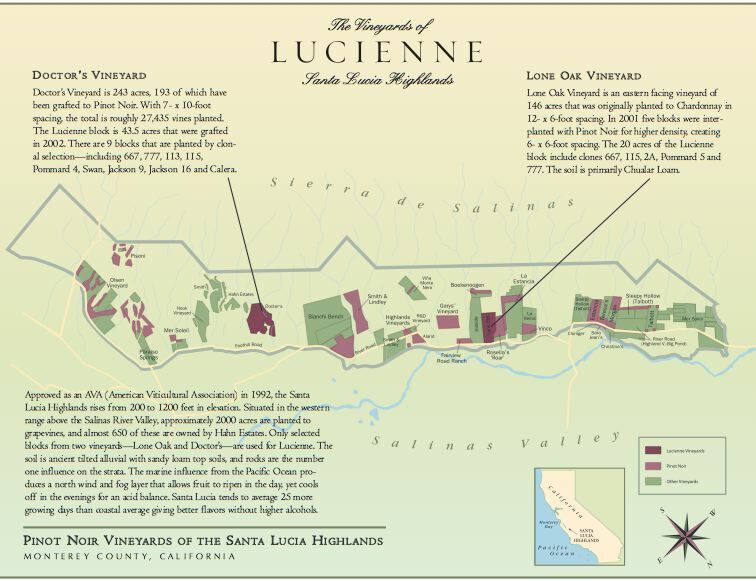 Lucienne is an estate winery within the Hahn Estates umbrella of wines launched with the 2005 vintage. Owned by Nicolaus Lucien Hahn, the winery’s name is derived from two sources - Nicky Hahn’s middle name Lucien, but in the feminine form to honor the mountain range where the vineyards are located, Santa Lucia. The Santa Lucia Mountain range was named by Spanish Padres who came to California to build a series of missions in the eighteenth century. The padres probably saw the luminescence of the mountain range and called it Santa Lucia (lucia is from the Latin root lux meaning light). 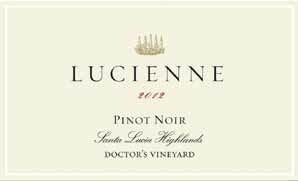 The goal at Lucienne is to produce premium Pinot Noir in small lots from special blocks of exceptional estate vineyards. The inaugural release in 2005 included a Santa Lucia Highlands appellation bottling and a Lone Oak single vineyard designation. Doctor’s Vineyard was soon added as a vineyard-designate and in 2012, four vineyard designated Pinot Noirs were offered from Lone Oak, Doctor’s, Hook and Smith vineyards, as well as a Lone Oak Vineyard Chardonnay. The location of Doctor’s and Lone Oak vineyards is seen in the map below. The winemaker since the inaugural Lucienne release has been Paul Clifton, the Director of Winemaking and General Manager at Hahn Estates. Paul grew up in the Monterey Bay area and came to wine from a firefighting career. In 1996, his pursuit of becoming a professional winemaker began at Bernardus Winery in Carmel Valley where he was mentored by Don Blackburn, a well-known Pinot Noir vintner who has passed away. Paul worked his way up the ladder at Bernardus, from cellar rat to cellarmaster. In 1999, he became the assistant winemaker at Byington Winery in the Santa Cruz Mountains. To further his knowledge of cool climate viticulture, he attended Lincoln University in New Zealand and received a postgraduate degree in viticulture. Upon returning to the United States in 2003, he began working at Hahn Estates with winemakers Adam Lazarre and Barry Gnekow. In time, Paul became the Director of Winemaking at Hahn Estates and brought the winery’s Pinot Noir program into prominence. His current winemaking assistant is Greg Freeman. Paul is rather shy and unassuming and he underplays his considerable accomplishments. A peek inside his personality is revealed in the “Winemaker Up Close & Personal” feature at the end of this issue. The consistent winemaking processes in crafting the Lucienne vineyard designates are fermentation in small open-top tanks, an initial 3-day cold soak, gentle manual punch downs, and free-run press off the skins. The four Lucienne Pinot Noirs reviewed here are available from the winery’s website store at www.luciennevineyards.com. The wines can also be tasted at the Hahn Estates tasting room in Soledad which is open daily. These are beautifully crafted wines that will find fans among those who seek out well-endowed and ripe-fruited Santa Lucia Highlands Pinot Noir. The wines strut out plenty of charming, sweet fruit propelled by modestly high alcohols, a reflection of the 2012 vintage.